William Congrove, Sr., born 1753 in Prince William County, Virginia, is one of the earliest ancestors of many Congrove descendants found in Virginia, West Virginia, and southern Ohio. Prince William County, Virginia was divided on May 1, 1759 to create Fauquier County, which is cited in records below. Per Ancestry.com, the CONGROVE name is probably an altered form of the English habitional name CONGREVE (or variants CONGREAVE and CONGRAVE) and came from CONGREVE in Staffordshire, England or CONGREAVE in Deberyshire, England. CONGREAVE is also an Old English word meaning "a road cut through the forest". William Congrove Sr. is listed in the 1810 U.S. Census as living in New Point, Wood County, (W)VA. Per William's Pension Application Hearing in 1833, he had moved to Wood County, (W)Virginia about that time. He is found living in Ohio in 1820 and 1830. William Sr. does not show up in the 1840 census. It is presumed that William died about 1836. There is mention of 2 others named CONGROVE that may have a connection to William Congrove, Sr. in this time period, but no concrete direct relation is known between them. A Moses Congrove was paying taxes as early as 1747 in this area of Virginia and was listed in several court cases from 1737, 1770, 1771, 1786, 1788, and 1790. William Congrove is also listed with Moses in court cases dealing with debts owed. A James Congrove is mentioned as the 2nd husband of Mary Pottenger Smith, the daughter of Robert Pottenger & Anne Evans, and the widow of Archibald Smith. Per the August 28, 1766 Prince George's County, Maryland Administration Accounts, Zach Lyles, the administrator of Archibald Smith (Mary Pottenger's 1st husband), stated: "Mary, widow of said Archibald, has since married James Congrove". Item. I give unto my daughter, Mary Pottenger, two hundred acres of land called Green's Delight near the eastern branch to her and her heirs forever. Item. I give unto my daughter, Mary Pottenger, an equal part of whats before left amongst my four daughters as above and on the same conditions these interlinings made the 22nd day of April 1738 in the sight of me. Children Listed: Elizabeth Camphin, Anne Beall wife of James Beall, Rachel Magruder wife of Zadock Magruder, Eleanor MacGill wife of Thomas McGill, and Mary Congrove. 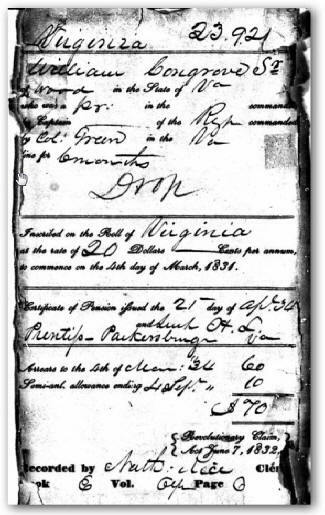 an "older" brother to William Congrove Jr. is mentioned in the 1833 American Revolution Pension Statements for William Congrove Sr.
William Congrove, Sr. applied for a pension for the Revolutionary War. As can be seen in the document, William was residing in Wood County (W)Virginia in the early 1830s and had drawn a pension. Click on the document picture to see the whole document and a transcribed copy. The working theory is that Elijah Congrove (1787-1846) had at least 8 children, 5 boys and 3 girls. This is based on the combination of the 1810, 1820, 1830 and 1840 census records. Not all the names are known, however, the theory indicates that Thomas, Henry, George Washington, Benjamin and Harrison are the sons and Margaret and Elizabeth are two of the daughters. A marriage record for Henry states his father is Elijah. The connection between the rest of the children and Elijah is by deduction from several records. (See doumentation time line below). 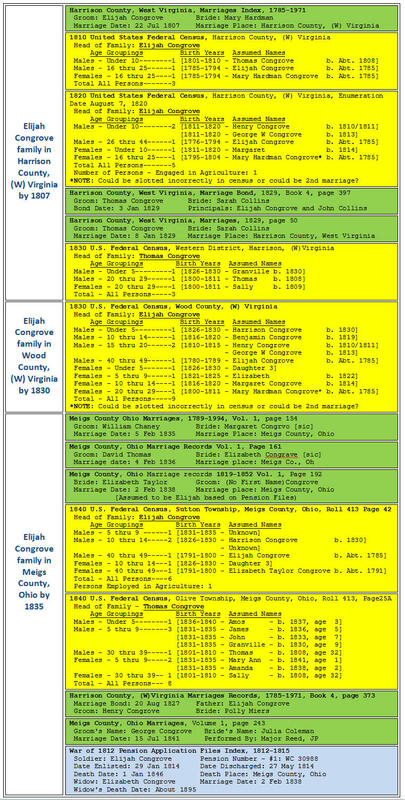 Below is documentation time line for Elijah Congrove from Harrison County to Wood County (W)VA to Meigs County, Ohio to show the relationship between Elijah Congrove and his assumed children. Many of the Congrove families migrated to Ohio in the mid 1800's. Below in a map to show that migration. There is another George Washington Congrove born in 1825 and married Deborah Taggert. They lived in Jackson County West, Virginia in 1850, 1860, 1870, and 1880. Jackson County borders Wood County, WV and Meigs County, Ohio. It is assumed that he is the son on William Congrove, Jr. (b1775). This connection is by deduction and not by actual documentation. There are two THOMAS CONGROVEs born in 1808. One is the son of Elijah Congrove (cited above). The relationship and parentage of the other Thomas Congrove is not known. The second Thomas Congrove has many descendants. He was born in Meigs County, Ohio and lived in Meigs County, Ohio. See below for more information. Congrove Family Descendant Book (1753 - Present) - a privatized (dates & places of living people omitted) 10 Generation Descendant Book (PDF), starting with William Congrove, Sr. - 224 pages plus index.